NEVS AB and DiDi Chuxing have formed a partnership and finalised steps toward an extensive cooperation. 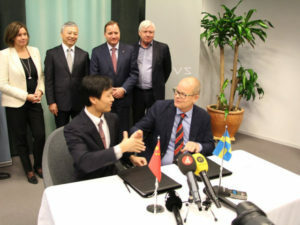 The formal signing took place in Trollhättan in the presence of, among others, the Swedish Prime Minister Stefan Löfven. “Now we have a platform and the right partner to realise a fantastic journey to make our vision come true.” said Stefan Tilk, NEVS’ president and CEO. The companies have announced the ultimate goal will be to produce an electric vehicle that offers the mobility services provided by DiDi, as well as self-driving and on-demand mobility in the future. NEVS unveiled the InMotion concept at CES Asia in Shanghai, in June, however, the first vehicle to be used in the cooperation will be the NEVS 9-3. DiDi services include taxi hailing, private car hailing, Hitch (social ride-sharing), DiDi Chauffeur, DiDi Bus, DiDi Minibus, DiDi Car Rental and DiDi Enterprise Solutions. As many as 20 million rides were completed on DiDi’s platform on a daily basis in October 2016, according to the company.